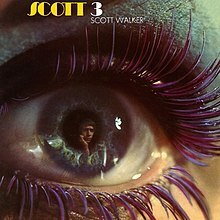 Scott 3 is the third solo album by singer songwriter Scott Walker. Upon release in 1969, it met with slightly less sales than his previous albums, as pop audiences struggled to keep pace with Walker's increasingly experimental approach, though it still reached #3 on the UK Album Chart. The dense, lush string arrangements by Wally Stott seemed to evoke a Vegas-style lounge crooner atmosphere, but one tinted with surreal drones and touches of dissonance. Since its release, it has been regarded by many of Walker's fans as a favourite. The title of the compilation Fire Escape in the Sky: The Godlike Genius of Scott Walker is taken from the lyrics of the song "Big Louise", and the 2006 documentary Scott Walker: 30 Century Man is named after "30 Century Man". A cover of "30 Century Man" by the Jigsaw Seen was used in the animated film Futurama: Bender's Big Score. Marc Almond covered the song "Big Louise" in 1982 with his band Marc and the Mambas on the album Untitled. The final three tracks are covers of compositions by Jacques Brel. All tracks written by Scott Walker (credited as Noel Scott Engel), except where noted. The original U.S. Smash label vinyl issue omitted "30 Century Man", replacing it with "Lights of Cincinnati", a UK non-LP single from the same period. This issue also featured a different cover design from the UK Philips release. Wally Stott - Arranged and conducted all songs except "30 Century Man" and "Funeral Tango"
Peter Knight - Arranged and conducted "Funeral Tango"
^ a b c "Release: Scott 3 - MusicBrainz". Retrieved 2010-08-10. ^ "VinylFanatics.com Vinyl Records, Vinyl Record Reviews, News, Forum Vinyl reviews Audiophile vinyl The best site for vinyl records - UPDATE : Vinyl Lovers - New record label?". © 2010 VinylFanatics.com. Archived from the original on October 13, 2008. Retrieved 2010-08-11. ^ "Chart Stats - Scott Walker". chartstats.com. Archived from the original on 2012-12-05. Retrieved 2009-02-12.